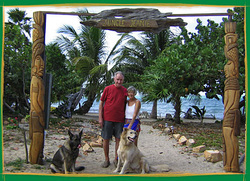 Jungle Jeanie's By The Sea "Our Belize Vacation" - "Our Belize Vacation"
Whether you are looking for a private romantic beachfront get–away or the perfect family vacation Jungle Jeanie's by the Sea is the place for you. 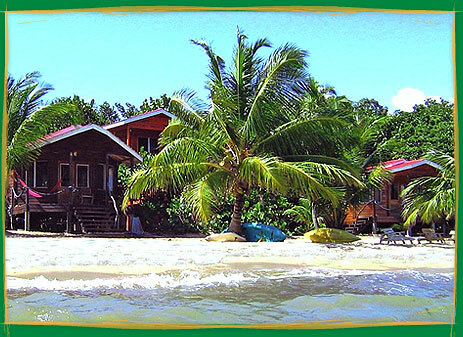 Nestled on a private acreage bordering what many consider the best shoreline in Belize, Jungle Jeanie's is one of this Country's best kept Secrets! 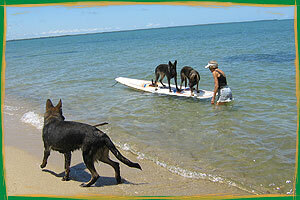 We are located one mile south of the village of Hopkins, a pleasant 10 minute beach walk or, if you prefer, you can take the road. 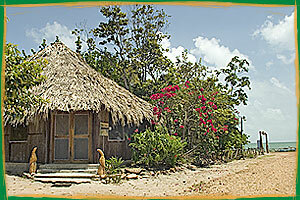 Hopkins, a native Garifuna village, is located just 40 minutes south of Dangriga Airport. The village is accessible by road or boat. 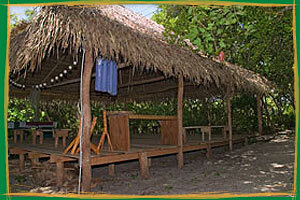 All Cabanas have private bathrooms with heated shower and toilet. 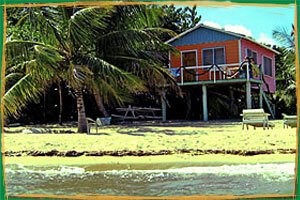 Spectacular beachfront only twenty yards from the Caribbean Sea. 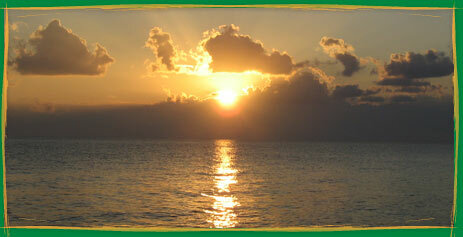 Enjoy incredible sunrises & sunsets from the deck as you enjoy a beverage. 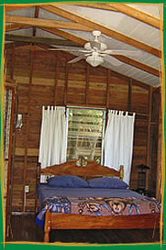 This chalet features a queen bed, private washroom with shower, ceiling fan, microwave, refrigerator and coffee maker. 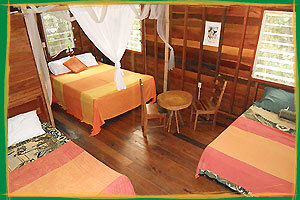 One of the most popular chalets for couples. 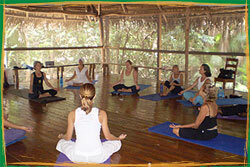 Incredible retreat in the skies, above the trees & overlooking the sea. 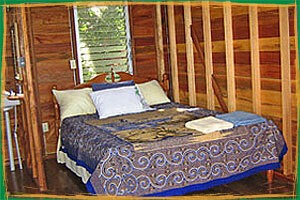 Ideal for honeymooners or anyone looking for a perfect getaway into a serene environment! 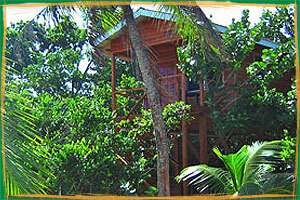 The tree house features a queen size bed with ceiling fan, private washroom with shower,refrigerator, microwave and coffee maker. 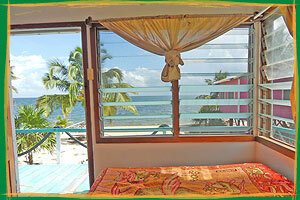 You will enjoy your own private deck with never ending views. Perfect for the romantic in all of us! 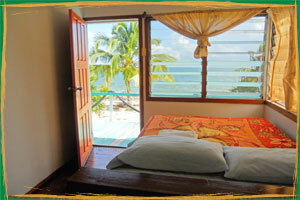 Awake to the sounds of the beautiful Caribbean Sea. 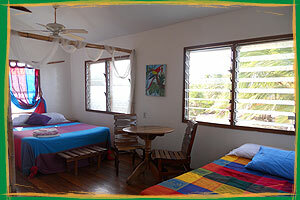 This beach house features both 1 queen and 1 double beds, making it ideal for families. Included in this beach house is a large private washroom with shower, refrigerator, microwave and a ceiling fan. 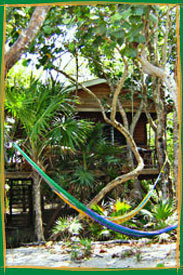 Ever dreamed of living like the Swiss Family Robinson? 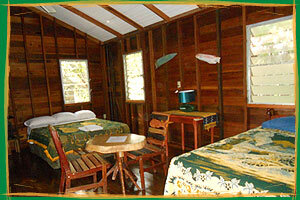 Now you can, as you enjoy our family sized loft surrounded by the thick green canopy of nature. 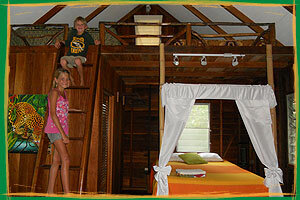 This jungle loft features 1 queen bed on the main floor and 2 double beds on the top level. It also features a large washroom with shower, a ceiling fan, sink, microwave and refrigerator, perfect for those late night snacks & to keep your refreshments chilled. 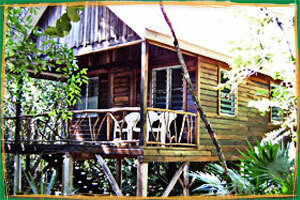 This jungle loft has a very large deck which is popular and perfect for families. 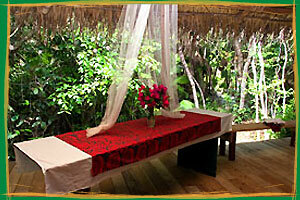 Secretly nestled among tropical trees, this cabana is set back in the resort for greater privacy. 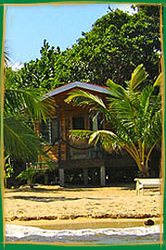 Featuring an open view of the Caribbean Sea this cabana has a queen & 2 double beds with a private washroom with shower and refrigerator. You can enjoy your evenings on your own private deck, another family favorite. 1 queen and 1 double beds, fridge, sink, microwave and a coffer maker.